Here’s another post from our “Real People” series written by web celebrity Casey O’Halloran from The DIY Playbook. Casey chats about her recent interstate move with PODS and HireAHelper from St. Louis to Chicago. Let’s face it, moving is not fun. It’s difficult, time-consuming, stressful…all of those terrible things wrapped up into a poorly packed cardboard box. But we all know that moving is a very real and inevitable part of life. How Can We Move With No New Place To Live? But we had one problem. We couldn’t just load up a truck and bring all of our stuff to our new home in Chicago, because we didn’t yet have that new place in Chicago. Minor detail, right? Then we thought about renting a storage unit. But boxing up all of our stuff, putting it into a truck, unloading the truck into the storage unit, and then doing that allllll over again. No thank you! After looking at a few options, we finally decided to rent a PODS container. We would load it up ONE TIME, transport it to Chicago, and then unload that bad boy once we found our new home! Less time spent moving, more time spent finding a new place to live. 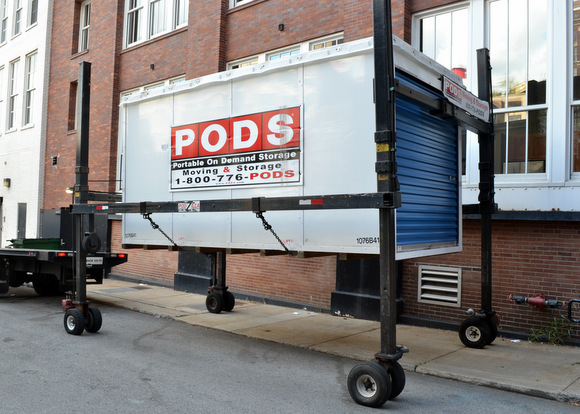 One reason we went with PODS was that we liked that they store the container for you, until you’re ready for it to be delivered to your new place. But, because we were moving in and out of condo buildings we were a little nervous about where we would actually place the container. It’s not like we’re in a house where we could just plop it on the driveway. Can A PODS Container Park at a Condo? In St. Louis, we consulted our building management and they said we could put it in the back alley. 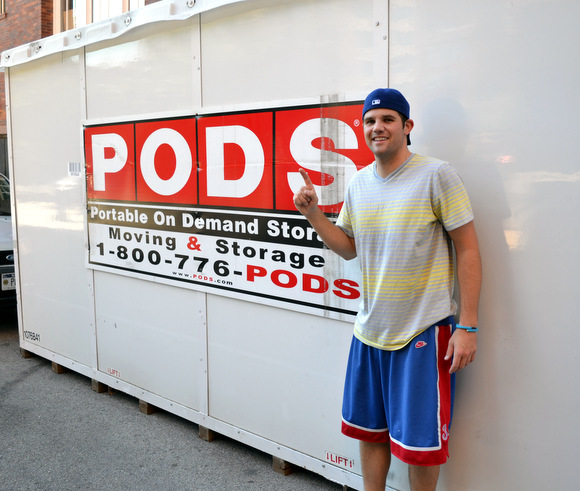 PODS also assured us that it was a-okay with the City of St. Louis. In fact, they handle registering the device with the city. As long as you have it out there for less than a week…you’re not breaking any laws. But in Chicago, it’s a different story. Containers are not permitted on the streets or in alleys, so they can’t be delivered to some Chicago zip codes. 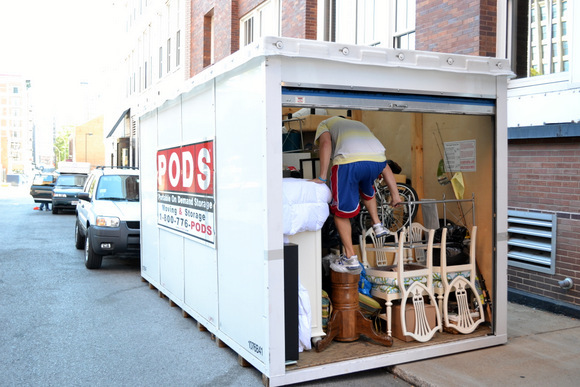 However, PODS does partner with moving companies who will “shuttle” your stuff from your container to your new home. If you’re moving to a big city (Chicago, NYC….) 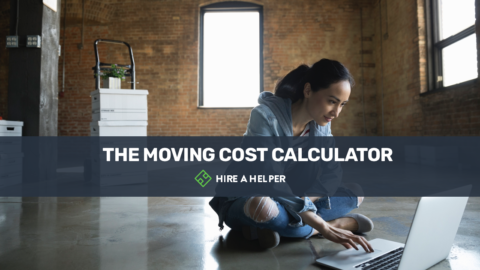 be sure to consider the cost of the shuttle service into your moving budget. 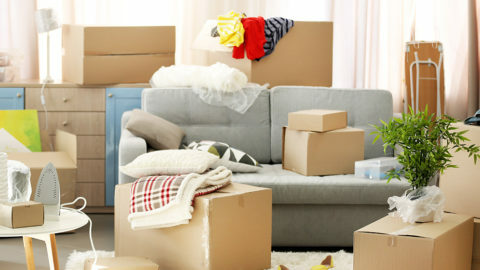 What’s Really The Best Way To Save Money On A Move? In order to save some cash, we decided to only order the 16x8x8 PODS container. That meant that movers and moving supplies (including boxes, tape, dollies, or moving blankets) were not included in our PODS package. 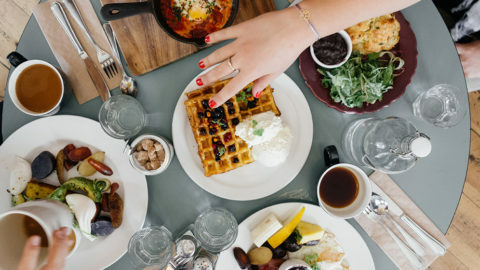 We figured we could improvise and find a way to make everything work on our teeny, tiny budget. Our first inclination was to beg ask all of our friends and family to drive down to St. Louis and help us for the weekend. But to keep our backs and belongings safe, we eventually hired help. 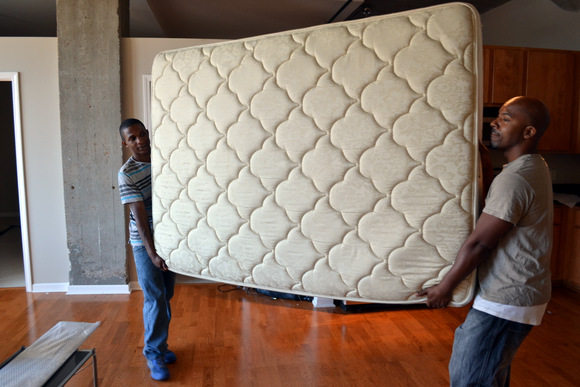 We turned to hireahelper.com and after reading some glowing reviews about a particular company (Morris Moving and Storage), we found 2 local movers to help us. We hired 2 men, for 3 hours, and asked that they bring their own dollies and moving equipment. Our help arrived on time and ready to work. On moving day, “the muscle” tackled the heavy furniture pieces, while we focused on carting all of our small items down to the moving dock. This was the best system because we could tuck small boxes and items right alongside the big furniture. It maximized our space, and kept everything tight and secure in the container. Not to mention it saved us some serious time! One neat thing is HireAHelper will text you and ask if you need more time with your helpers. You just simply text back “yes” or “no” and they’ll add the payment onto your bill. This was pretty darn helpful, because typically when you’re moving you’re not near a computer or don’t have your internet set up yet. We thought this simple “text to pay” system was genius. It took 5 people, 3 hours, and 1 packed PODS container…but we got ‘er done! We locked up our PODS container with our own lock and our container was picked up two days later and taken to a secure storage center in Chicago. Our container was in storage for a little over a month, and during that time we were fortunate to find a new place to live. PODS’ Chicago moving partner (EMS Moving) shuttled our belongings to our new home. Was moving a breeze? Definitely not. But our experience was less painful because of our portable container and our hired help. Hopefully we won’t be moving for a long time, but when we do… I think we will move with PODS and HireAHelper to make our moving experience a good one.